This colorized mosaic from NASA's Cassini mission shows the most complete view yet of Titan's northern land of lakes and seas. Saturn's moon Titan is the only world in our solar system other than Earth that has stable liquid on its surface. The liquid in Titan's lakes and seas is mostly methane and ethane. The lakes and seas on Saturn's largest moon Titan hold massive amounts of liquid hydrocarbons — 40 times more than are found in Earth's proven oil reserves, new observations by NASA's Cassini spacecraft suggest. Titan, which is about 1.5 times bigger than Earth's moon, harbors about 2,000 cubic miles (9,000 cubic kilometers) of liquid methane and ethane on its frigid surface, researchers announced last week. The hydrocarbons are almost all contained in an area near Titan's north pole that's just 660,000 square miles (1.62 million kilometers) in size, a region slightly larger than Alaska. "We think it may be something like the formation of the prehistoric lake called Lake Lahontan near Lake Tahoe in Nevada and California, where deformation of the crust created fissures that could be filled up with liquid," Randolph Kirk, a Cassini radar team member at the U.S. Geological Survey in Flagstaff, Ariz., said in a statement issued by NASA last week. Titan is often pegged as a prime location to understand more about Earth, especially because it is the only solar system body other than our planet known to have stable liquid on its surface. Titan is also large — it's bigger than Mercury — and has active weather, including possible cyclones. 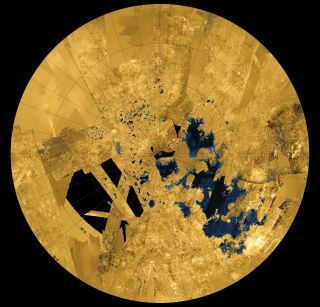 Newly released radar data from Cassini also measured the depth of Ligeia Mare, a first for any lake or sea on Titan. Ligeia, Titan's second-largest sea, is made up of methane, scientists said, and is about 560 feet (170 meters) deep, making at least part of it deeper than the average found in Lake Michigan. "This was possible partly because the liquid turned out to be very pure, allowing the radar signal to pass through it easily. The liquid surface may be as smooth as the paint on our cars, and it is very clear to radar eyes," NASA officials wrote in a press release about the discovery. NASA also released a new photomosaic of Cassini images showing the bodies of liquid hydrocarbon in Titan's northern hemisphere. The $3.2 billion Cassini mission launched in 1997 and has been orbiting Saturn since 2004. In recent months, scientists noted several changes as summer approaches in the northern hemisphere of Titan, such as a surprising rise in the moon's atmosphere.